St. Kitts and Nevis’ Prime Minister the Right Hon. Dr. Denzil L. Douglas has welcomed New Zealand’s decision to establish a High Commission in Barbados. He said he was pleased that New Zealand has taken this particular step at a time when other countries are scaling back in establishing new diplomatic missions overseas. “St. Kitts and Nevis welcomes the opportunity. It is a sign of confidence in your country’s desire to improve the relationship at a time when economic and financial challenges remain. We are in a region that is still vulnerable to natural disasters. It is good that we can rely on New Zealand and other nations to assist St. Kitts and Nevis and the Caribbean region in the spirit of friendship and co-operation,” said Prime Minister Douglas. Dr. Douglas, who was supported by Acting Permanent Secretary in the Ministry of Foreign Affairs, Mrs. Astona Browne, also mentioned the government’s plans for moving St. Kitts and Nevis towards a green economy and the focus on solar, geothermal and wind energy to stem the high cost of fossil fuel. He informed the New Zealand diplomat of the decision to close the sugar industry and the new introduction of a new economy based on financial services, tourism, off-shore education services and non-sugar agriculture production. The St. Kitts and Nevis leader also spoke of the challenges of ensuring that the youth of St. Kitts and Nevis obtain skills along with vocational and academic achievements. The New Zealand High Commissioner in responding to the welcome of Prime Minister Douglas noted that she was happy to see New Zealand-made products on the shelves of St. Kitts and Nevis. 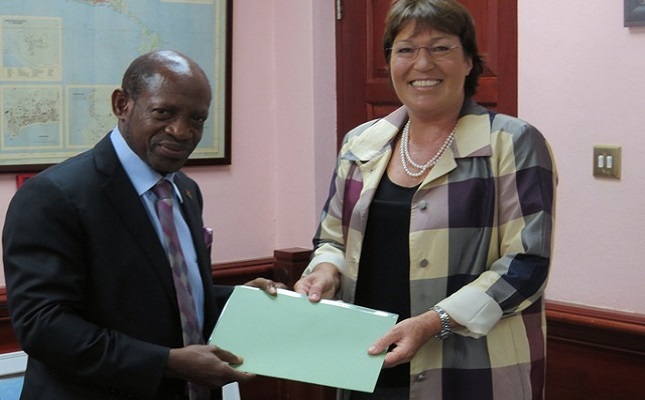 Ms. Henderson, who was accompanied by Special Envoy, Sir Don McKinnon and other officials in their Ministry of Foreign Affairs, said she was impressed with St. Kitts and Nevis’ commitment to green energy, pointing out that New Zealand provides 50 percent of its energy from hydro and 15 percent from geothermal. She said New Zealand has already begun to hold discussions with Ministry of Energy officials on a feasibility study on how the excess energy can be sold or utilized. New Zealand is also willing to help St. Kitts and Nevis in the areas of livestock development, education, agriculture, energy, disaster risk management and scholarships.